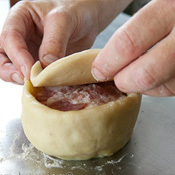 Come along to Ye Olde Pork Pie Shoppe and make your very own Melton Mowbray Pork Pie! Please telephone our office on 01664 562 341 to enquire about availability, or fill in the form below. A member of our team will call you on the telephone number provided to confirm your booking. We will require a deposit of £50 to secure your booking, payable by credit or debit card. In compliance with Health & Safety legislation, all people attending the Pork Pie Experience must be aged 16 or over. The outstanding balance will be payable on the evening. Approximately 4 weeks prior to your evening experience, please telephone and confirm the exact number of people attending. For the benefit of everyone concerned it is important that the experience begins, for the whole group, at your specified time. Unfortunately no allowance can be made for members of your group who may arrive late. Please enter your tel. no.